Budget Containers For Moving Homes | You Pack Removals ""
HOME / Budget Containers For Grandmas Memories And Designer Homes! Budget Containers For Grandmas Memories And Designer Homes! I wish that I had access to a budget container years ago! You see I’m from Melbourne, and about five years back I bought a small parcel of land in far North Queensland, that, while a great investment left me little money to build a holiday home—the reason I bought the land in the first place. But if I had known what I know today, I would have spent the money I had left over on a budget container rather than a gumtree green 4WD Pajero. That’s because with my Pajero money I could have built my own bill free—yes with a few solar panels, a generator, and a well this is possible—energy efficient, eco-friendly, designer container home years ago! And today I’d have had a few holidays under my belt if I’d known back then what I know now! Let me tell you about the designer container home revolution! A trend has been hitting the world in recent years, where designing and constructing your own striking home using budget shipping containers has become chic—giving you a super cheap alternative to regular housing. And… for most people I’ve spoken to, an exciting and extremely economically gratifying experience to boot. In fact as the price of housing and building materials dramatically increases, and with over 6.5 million containers in Australia alone, the ‘up-cycling’ model using budget containers is being eagerly embraced by new home-buyers everywhere! People all over the planet are now turning to the humble shipping container to drastically shave their building costs and create the home of their dreams! Budget containers are cost-effective (you can buy a second hand 40ft unit starting from $2,000), they are hard-wearing and robust, and because of their shape they can easily be adapted into interesting design concepts for pennies on the pound! And their sheer versatility, and easy adaptability, has drawn flocks of specialist container Architects who want to have the flexibility to work with more adventurous spaces and minimalist designs. But designer container homes are not the only thing you can use a budget container for—far from it! What are budget containers used for other than the obvious? Modification branding—take a look at our Ben and Jerry’s Open Air Cinema branded budget container here. Ablution units, branded units, shelter, storage solutions, refrigeration units, lunch facilities, onsite offices, switch rooms, training spaces, mobile workshops, and of course designer homes. In fact the ways that you can transform budget containers into pragmatic solutions, or creative spaces, are endless and only limited by your imagination. But have you ever tried to do the research and find the best container options out there on your own? It’s frustrating to say the least, and is a minefield of contradictory priced solutions! For me it was a pain in the neck—literally! With some long and hard searching you may be able to find a cheap alternative, but let’s face it, if you are using a budget container to create the ultimate designer home, or to be used to move precious cargo—is it really worth skimping on quality? Like anything you get what you paid for, so pay for quality! That’s where You Pack Removals™ come into the picture. They can advise you, for free, on how to find the perfect budget container for whatever your needs are! 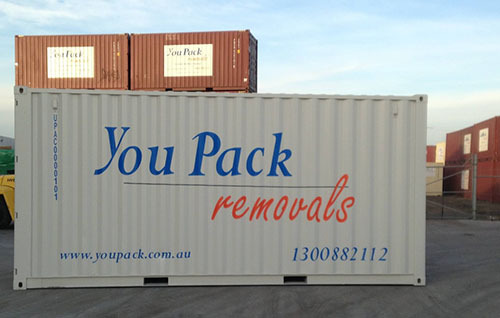 If you’re transporting your grandmother’s loved furniture, treasurable memories, odd paraphernalia, precious cargo, priceless objects, hush-hush documents, your new Bolivian 43ft cruiser, or a custard coloured Holden Commodore 6 seater— their budget containers will get your goods there, on time, every time, Budget container removals are the best in the business. Or if you want to design the perfect budget container space, they can provide you with shipping containers—of various sizes to suit your budget—and advise you on the best solutions! Who do you go to for the best budget container deals in the country? Who will save you money, make your life easier, and save you time? You Pack Removals™ will of course. Their motto is: You Pack, We Move, You Save; so all you need to think about is how to arrange, or design your new space. Get your budget container today! Call them on 1300 882 112, and a chipper You Pack Removals™ team member will provide you with all the information you need to know. Or alternatively click here and find out more.